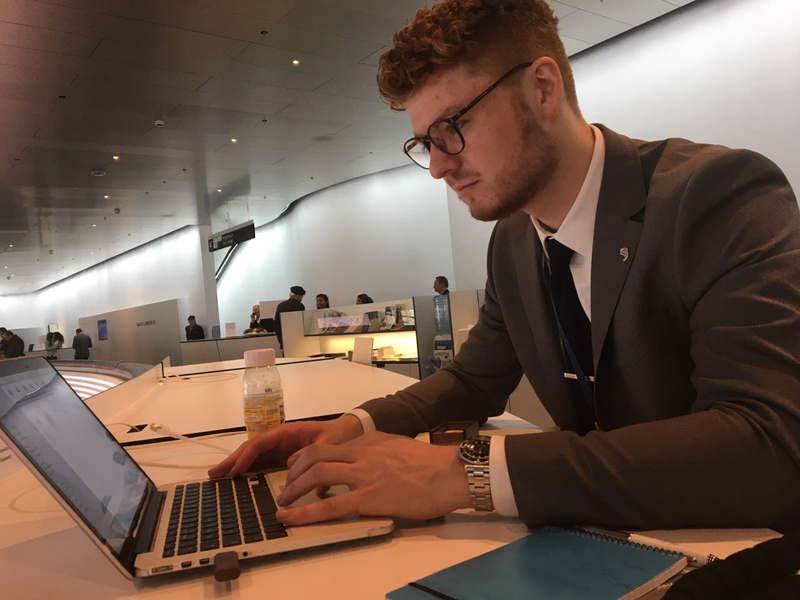 A late night of preparing video footage for our YouTube channel and many drafts of upcoming articles, Ben and I were eager to set off to the show. 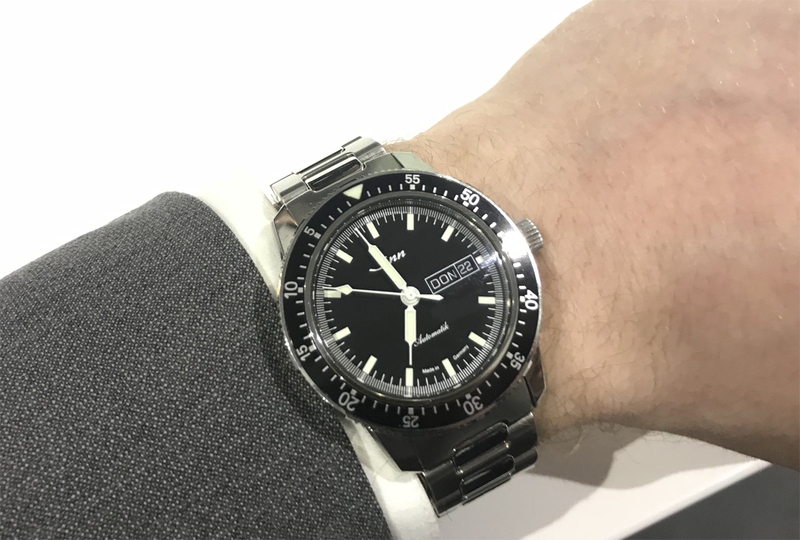 A quick visit to the press centre allowed us to catch up on a few write ups and then head off to see the first brand of the day, Sinn. In horology terms, Sinn are fairly new to the game but have made a big impact with watch enthusiasts. After only a short amount of exposure to the watches, I can fully understand why. Ben and I were immediately greeted by a friendly brand representative who gave us full access to their whole range of watches. 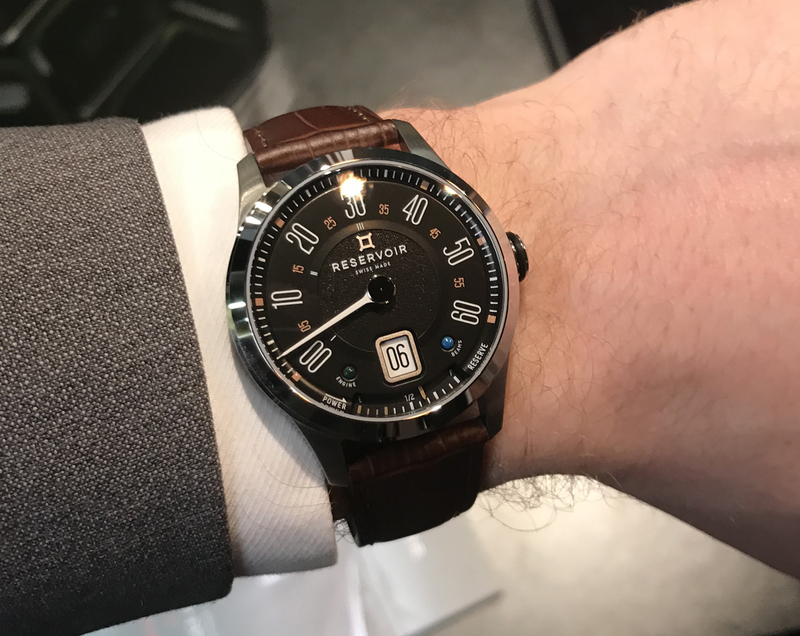 After the initial effects of feeling like children in a sweet shop subsided, myself and Ben request to see the latest models for 2018 and then I selected a few watches I'd heard a lot about and desperately wanted to get my hands on. 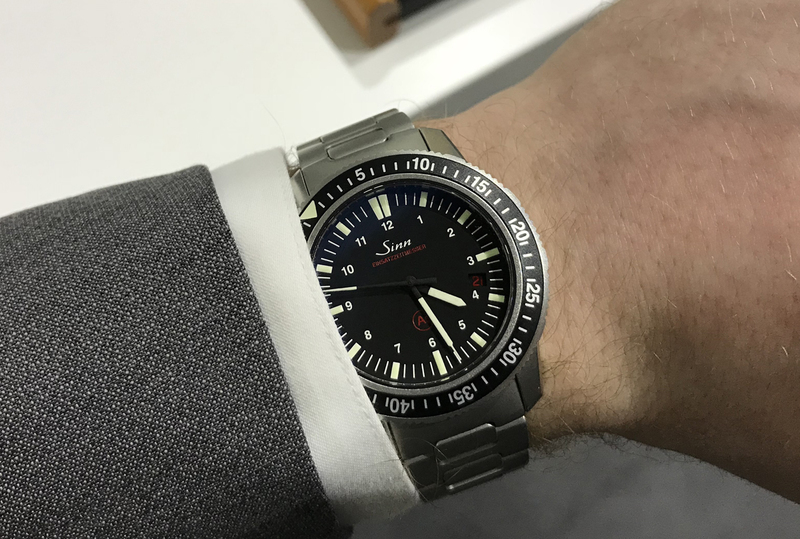 The Sinn 103 Sa B E Limited was the first release we saw and were immediately blown away. 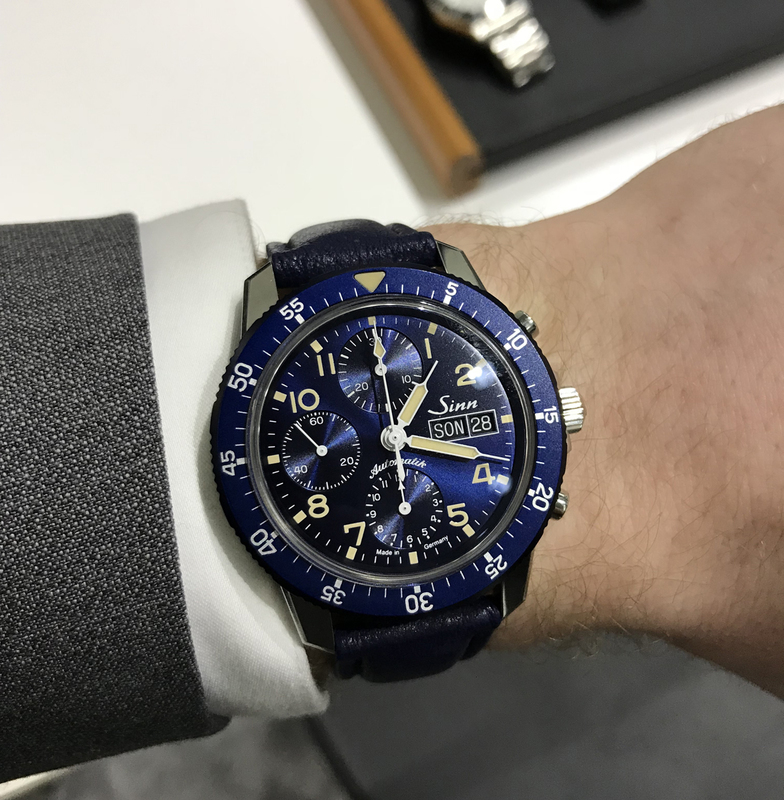 The dial is an incredible sunburst blue with even darker blue sunburst on the sub-dials. Add on top the yellowed patina on the hands and markers combined with the full lumed pip on the bezel, and you've got yourself a truly stunning piece rich with heritage. For a relatively simple design, this watch has a very unique look to it and that larger size makes for a very legible dial. Next up we look at the Sinn SRS Chrono. This watch was great on the wrist. Once again we see the use of red details throughout the watch which has now been mixed with deep black hands, indices, logo and sub dials. Normally such a dark colour on a light dial doesn’t work too well, but on the SRS Chrono it looked great. The watch also using slimmer syringe style hands, which really helps bring identity to this piece. 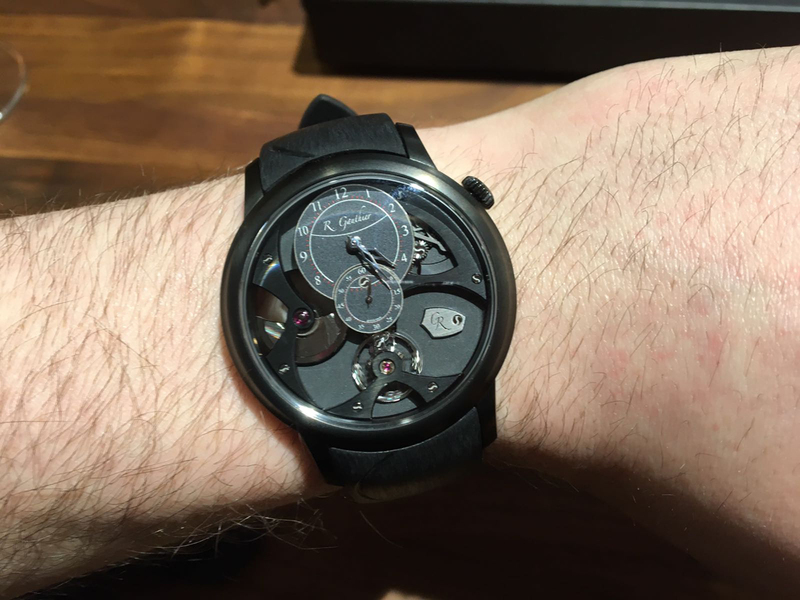 How to create a real 'inspired by' watch? Next up, as Ben went wondering off looking at even more watches, I headed straight for a brand I’d read an article about recently. Reservoir Watches are a French company set up only a year ago based on one mans passion for measurement instruments of days gone by. 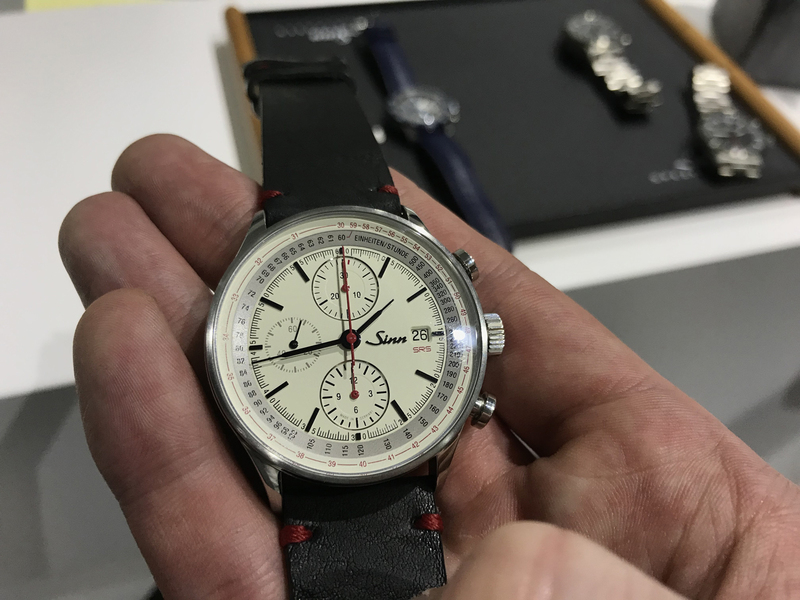 As we all know, motorsports inspired watches are very popular at the moment, however this brand has to be one of the first ones I’ve seen who have combined motorsports and horology passion evenly in one product. I won’t say too much about these as I’d like to cover them in more detail in the future, but the Longbridge which is inspired by the British Mini Cooper was my favourite without a doubt. Available in a green, brown and black dial this watch is a fantastic offer for any enthusiast of all things mechanical. As the day carried on, Ben and I were having such a good time at the independent side of the show we felt it was only right to stay their and look at one more incredible brand Ben had wanted to see for a while now. 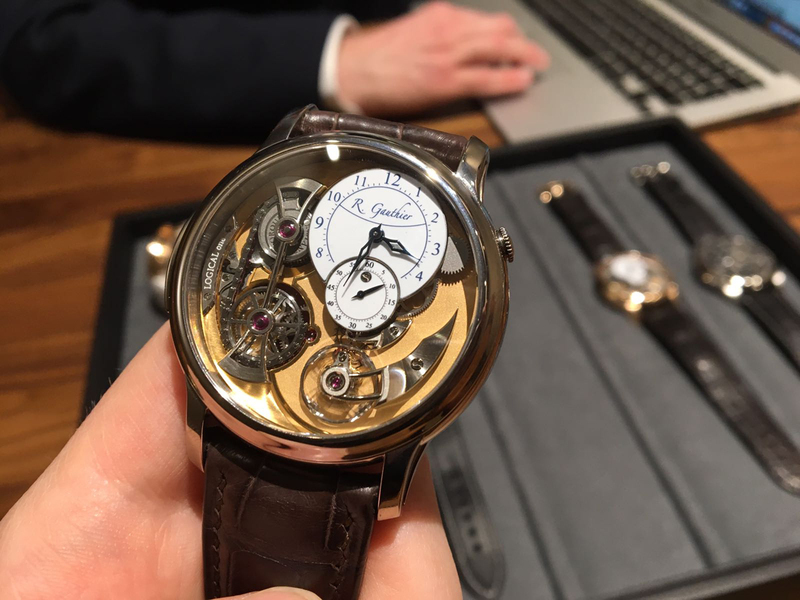 Romain Gauthier is an independent Swiss manufacturer of watches based in Le Sentier and Vallée de Joux, Switzerland. After only a short time spent with the faces behind the brand (Including the man himself!) it’s fair to say their tag line “The evolution of tradition” has never been more accurate. We were greet by Stephen from the brand who was extremely welcoming with champagne ready and waiting for us on the table. 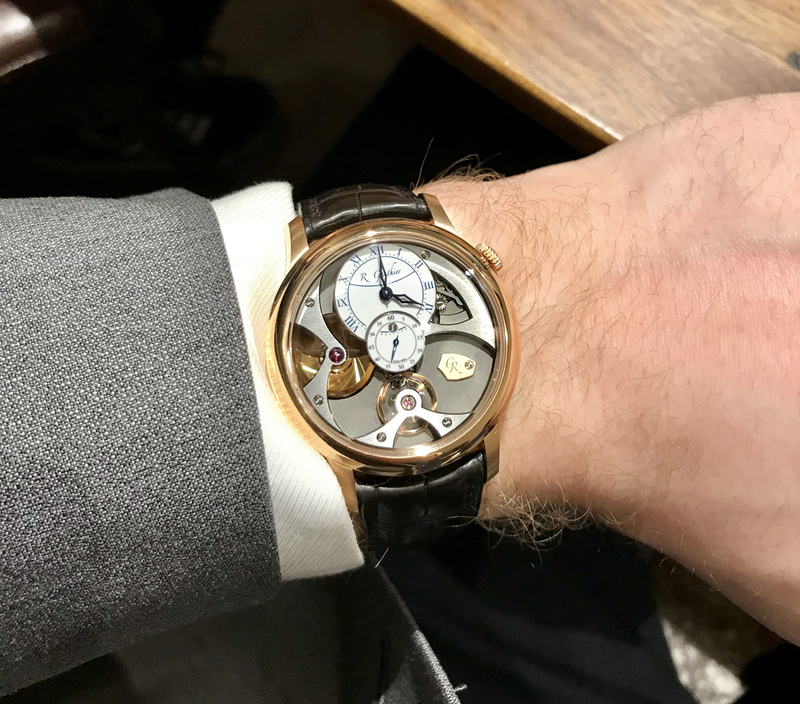 It didn’t take long for the pair of us to be surrounded by some of the most incredible watches I’ve ever seen in person, let alone got my hands on. 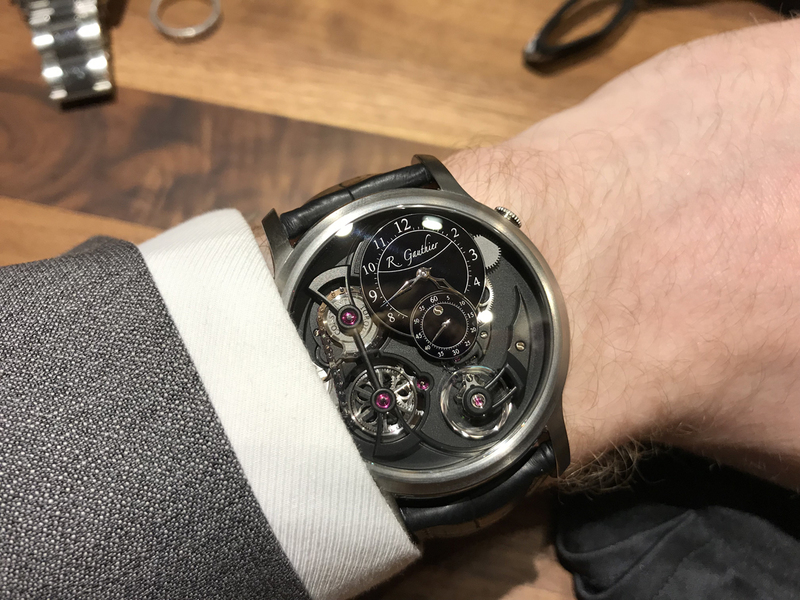 We were lucky enough to try on models such as the Logical One which uses some mind blowing technology which even now, I don’t think I still have my head around it all. The most stand out model to me was the Insight Micro Rotor. 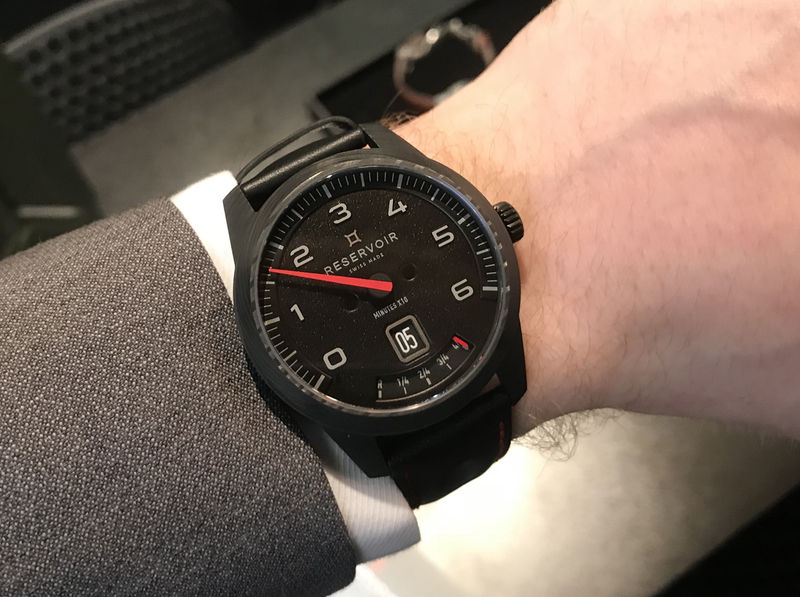 This 39mm case timepiece uses a thick micro rotor which is visible through the face of the watch and is available in either Natural Titanium with a blue enamel dial (from a distance you would be forgiven for thinking its stainless steel) Black Titanium with a dark grey dial giving the watch a somewhat sporty look and finally the Red Gold version which a white enamel dial. 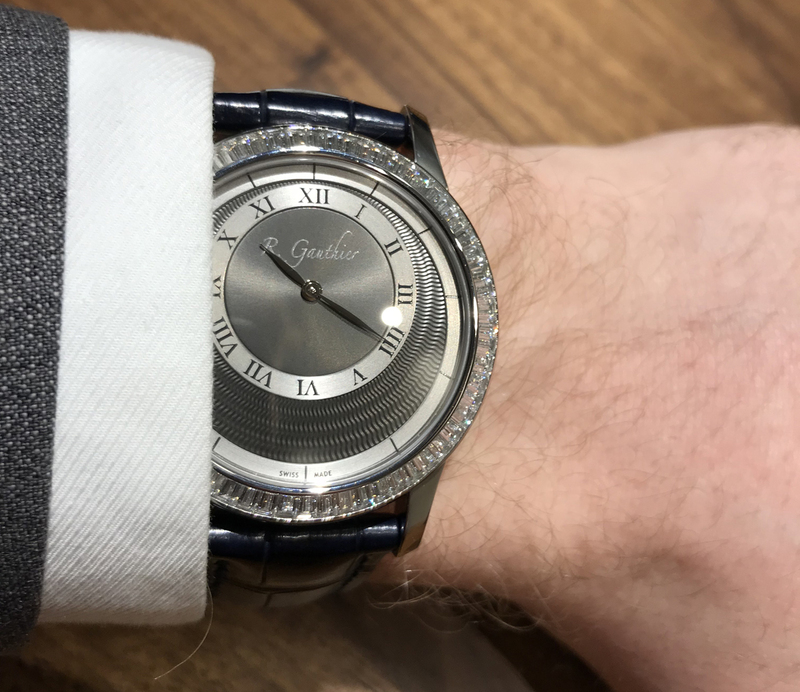 These watches were incredible thin when you consider the technology, watch making, finishing and the sheer amount of components powering these special watches. The Black Titanium version of this watch was such a cool looking piece, it would make for a fantastic, almost understated everyday watch. However, I was and still am, obsessed with the Red Gold version I tried on. For such a complex look timepiece it some how is so traditional, classic, timeless and just purely stunning. And that was our Day 2 at Baselworld. I was somewhat scared after the success of Day 1 and how well it went that Day 2 wouldn’t be able to live up to the hype, but incredibly it did. 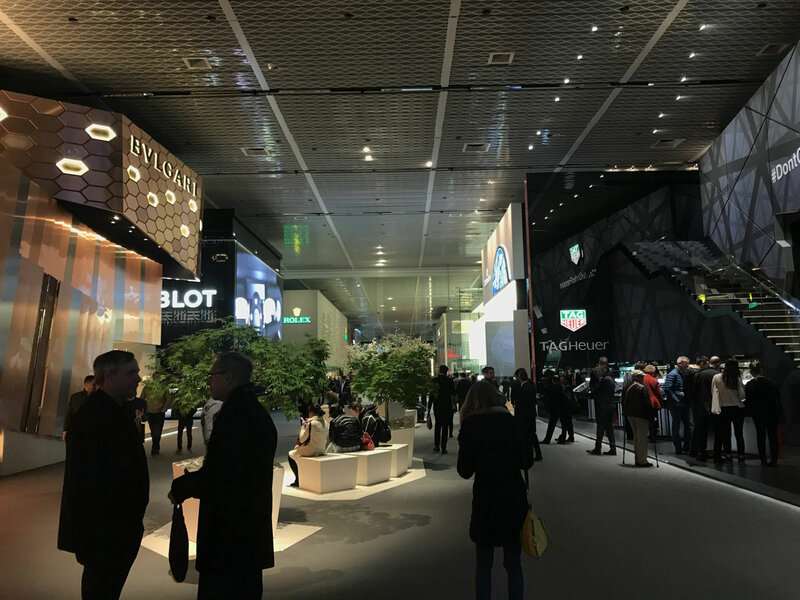 As with every Baselworld, 2018 was another unforgettable one. The watches and the people we both met have had a huge impact on us both and we can't wait for the next opportunity see even more next year!